A couple years ago, I posted this Valentine’s Day party that I planned for a church activity. 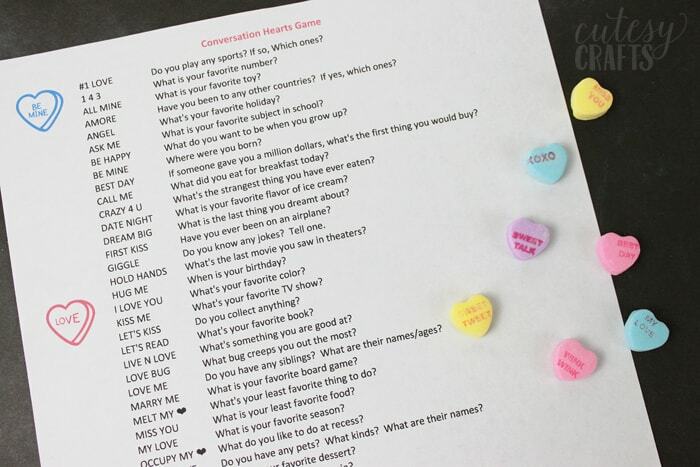 We played a conversation hearts Valentine’s Day game to help the women at church get to know each other better. It was so much fun for everyone! That game was geared towards adults, so I thought it would be a good idea to make a different one for the kids to play. It’s the same game, but I changed up the printable to have more kid-friendly questions. To play the game, get a big bag of conversation hearts (or 2 or 3 bags depending on the amount of kids) and pour them into a bowl. Each kid takes a turn picking out a heart and reading what it says. They find the word or phrase on the list and answer the corresponding question. The list is in alphabetical order, so that makes it easier to locate. I tried to find the most common conversation heart phrases, but I don’t know how much they vary from brand to brand or year to year. The ones I used for this list were Sweethearts. For the ones that I didn’t include or those that are illegible, there is an option at the bottom to choose any question to answer. You can split up into small groups or play all together as a large group or class. 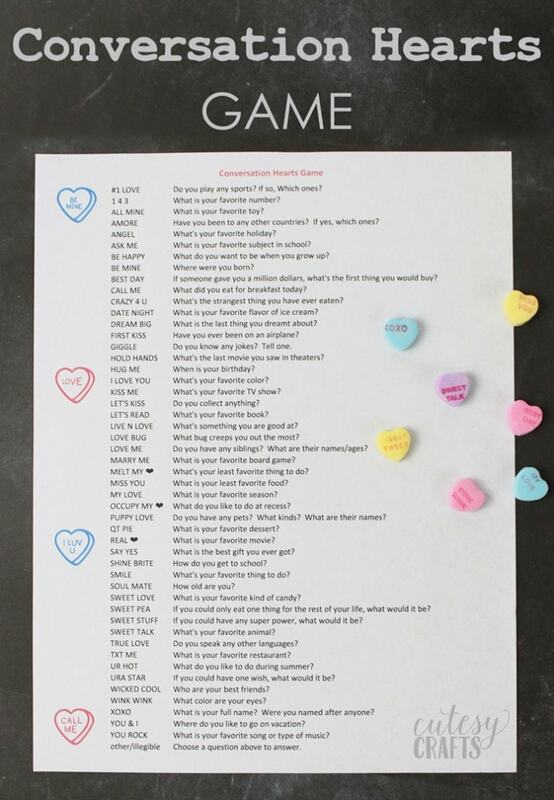 This Valentine’s Day game can be played at a school party or even just for fun as a family. I played with just my kids, and they loved it! Getting to eat candy AND talk about yourself! What’s not to love? Get the free printable here and let me know if you use it. I’m especially curious to know if the phrases are generally the same for all brands of the candies. I have also included an editable excel version, so you can change things. Need another Valentine’s Day activity for kids? This eraser-stamped heart shirt is perfect! This is too cool! I’m looking for some filler activities for our party and this fits the bill! I might use your questions but create a list with phrases that our specific to our bags, though! Anyway, thanks for the great idea! I would like to use this for Senior Adult gathering but would like to edit it a bit…could you share your sheet with me? wonderful idea! You’re welcome! Hope you have a wonderful time at your gathering! 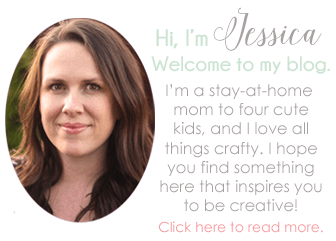 Hi Jessica, I’d love the editable version on xcel if you are willing to share. Could I get it sent to me as well? I just updated the post to include the spreadsheet for you to download and edit. Let me know if you need help getting it. I love this! Could I have an editable version? Thank you! I would like to use this for my girl scout troop. Would you send me an excel version as well? Thank you! I would love to have your editable version if you are willing to share. I am in charge of our Relief Society Valentines Party this week and this would be a fun game to play! Jessica, I had sent an email asking if you still had the conversation heart game last week. Do you still have it available. It’s perfect for the teen girls planning the homeschool co-op party this year. I really like this idea but I am not sure how to download a printable version. Can you help me out?? Hi, can you email this to me? Have a party in a few hours and this is perfect! Do you still have this list and if so could you email it to me? Do you want one that you can edit or just the PDF? If you click the link it the post (I think it says click here), you should be able to download both. Sorry, I made it really hard to see! Send me an email if you have problems, and I can send you the files. I was wondering if you have link to a printable of the kids game? I would love to use it with my kids that I see for occupational therapy. Thanks so much! Yes, the link isn’t standing out very well, but it’s under the second, horizontal photo. Send me an email if you can’t access it, and I can email you the file.